The Notorious Meddler: The Rogers Family Has A Big Connection To Clear Fork Baptist Church. The Rogers Family Has A Big Connection To Clear Fork Baptist Church. Two of Clear Fork Baptist Church's members are related to not one, not two...but THREE of our church's former pastors! Mike Rogers, and his sister, Sandi, are the great-grandchildren of James Maston Fairchild, who was our church's 8th pastor. He served from 1927 to 1929. His daughter, Ora, married Hershel Rogers. They were the parents of Ray Rogers, Mike and Sandi's father. Ray's sister, Winnie, was married to Wendell Selvidge. 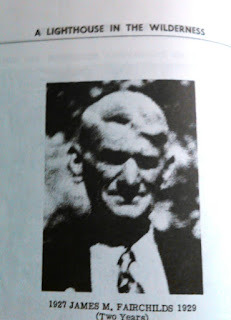 Wendell's grandfather was John W. Selvidge, the son of John Conway Jefferson Selvidge. John C.J. Selvidge was the 6th pastor of Clear Fork. 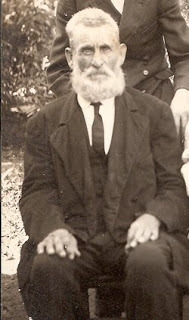 He served for seven months during 1889. Another of John C.J. 's sons, James Daniel Selvidge, was the 12th pastor of Clear Fork. He served from 1934 through 1936. James is a rarity, in that he was born in Clinton County. Most of Clear Fork's pastors were born elsewhere. James pastored at Stony Point Baptist Church for 26 years. He also pastored at Beech Bottom Baptist Church. How great it is that the Rogers family has such a big connection to our historic church.